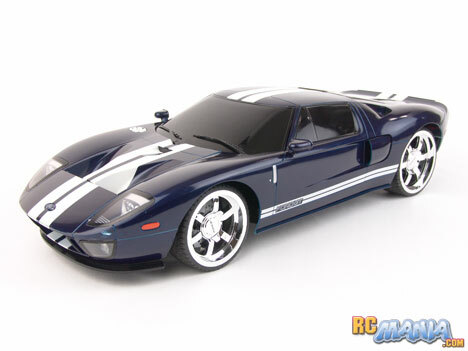 The XQ brand Ford GT is a 1/10th scale RC car available in several color schemes currently sold exclusively at Costco stores in the USA. An officially-licensed replica, the styling of the body is picture-perfect with excellent detail. Only the oversized chrome wheels detract from it at all (arguably), but if you like those, this is a great car to ven use as a display model on the shelf. As a full-function RC car, though, it sports realistic rear wheel drive and includes a rechargable 7.2V NiMH battery pack, a wall charger, and even a 9V battery for the controller. If you buy this, you don't need anything else to get rolling. The speed of the XQ Ford GT is very respectable -- definitely faster than the average amongst toy-class RC cars these days. However, at 8.4 mph through a speed trap on flat ground, the "140mph scale speed" notice on the box is clearly way, way off the mark (140mph times 1/10th scale should equal 14mph). Steering response is pretty fast and smooth, though there is no digital proportional control. The tires are low-profile, but made of a medium-hardness rubber that grips the ground well, giving the car pretty good handling. My only gripe is that the suspension is very stiff, so the car tends to bounce around a bit over tiny bumps in the road. Though it doesn't go as fast as it says, the XQ Ford GT from Costco is still a respectable value in my book. For $30 US you get a solid, good-sized, great-looking RC car with a rechargable battery, and even the battery you need for the controller. Good deal.